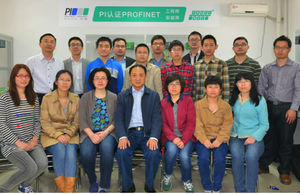 China PROFIBUS & PROFINET Association organized a 3-day Certified PROFINET Engineer Course in April, with the intention to train the trainers in anticipation of launching a new PITC in China. PI-China was honored to welcome Dr. Xiu Ji from the UK’s PI Competence Center at MMU to assist with the course and the examination process. The course incorporated the Certified PROFINET Installer Course on the first day and the Certified PROFINET Engineer course over the two following days. It provided in-depth training for participants covering PROFINET network operation, design and commissioning. Participants learned what goes on in a PROFINET network and about the telegrams that pass between PROFINET devices, how the network is configured and started up and finally, how the network deals with conflicts and other errors. All 16 participants passed the test held at the end of the course and were awarded a certificate.